Results appear to confirm the theory that stock market liquidity impacts and influences the ability of the market to fully reflect information. The impact of the sizes and development of capital markets on users of financial information will also be considered in this chapter – as well as other factors which could have a possible impact on the value relevance of accounting information. So will the issue of Shadow Banking and recent financial regulatory reforms which embrace the Dodd Frank legislation – as well as Liikannen, Vickers, Volcker rules and reports. Results appear to confirm the theory that stock market liquidity impacts and influences the ability of the market to fully reflect information. 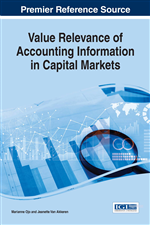 The impact of the sizes and development of capital markets on users of financial information will also be considered in this chapter – as well as other factors which could have a possible impact on the value relevance of accounting information. So will the issue of shadow banking and recent financial regulatory reforms. As well as investigating these observations, this chapter is aimed at investigating the validity of Efficient Markets Hypothesis and Efficient Capital Markets Hypothesis in emerging economies – as contrasted with advanced market economies. In so doing, it aims to contribute to the extant literature on stock market liquidity and liquidity in capital markets. Results appear to confirm the theory that stock market liquidity impacts and influences the ability of the market to fully reflect information. In line with the theme of the volume, the chapter will amongst other objectives, aim to contribute to the extant literature on whether capital markets in emerging markets economies, in particular, fully reflect information - hence demonstrating and highlighting the validity of the Efficient Markets Hypothesis (as well as the Efficient Capital Markets Hypothesis. To investigate the extent to which accounting information can be relied upon based on given market values and whether a relationship or pattern can be established in certain jurisdictions based on given operating variables which function in such economies. To highlight whether accounting reforms undertaken in investigated jurisdictions achieved their desired goals of improving the quality of accounting information and if such reforms were not successful, to propose measures which could address the current issues being faced by such jurisdictions. The term global liquidity is used by the Bank for International Settlements to mean the ease of financing in global financial markets (BIS 2016). Credit is among the key indicators of global liquidity and the focus of the global liquidity indicators estimated by the BIS and these indicators constitute part of the BIS's support for the G20's activities (see BIS Global Liquidity Indicators, 2016). Deep and liquid financial markets are considered important to financial stability. Market participants require liquid markets in order to effectively manage risks and their own funding needs. There is a significant body of literature that suggests that financial derivatives reduce risk. A resilient and effective financial system enables corporates to manage business risks, such as currency, interest rates or commodity price risks. Market liquidity is also critical in maintaining the resiliency of financial markets during times of stress. Benos and Zikes (2014) find that frictions in inter-dealer markets inhibited dealers’ ability to share risk and manage their inventories, which translated into a higher cost of trading above and beyond what can be explained by funding costs and aggregate uncertainty (PWC, Global Markets Liquidity Study, 2015, p. 19).